Southampton travelled to Manchester as they faced Mourinho’s United in the second game of the new Premier League season. Despite being given a considerable share of the possession, they were unable to create against a resolute and compact home defence. The match was largely anticipated as the return of Paul Pogba, who made his first appearance at Old Trafford since leaving for Juventus, becoming one of the world’s best midfielders, then re-signing in England for a record-breaking €105m. Yet despite a strong performance, the French star wasn’t the key figure as Zlatan Ibrahimovic converted two goals to see his side ease past Southampton. Out of possession, Rooney joined Ibrahimovic in the first line of players and the United team created a 4-4-2. In this shape, they sat in a mid-block which focused on controlling the rhythm of the game and maintaining stability within the defensive shape itself. Mourinho’s side were generally happy for Southampton to see the majority of the possession. Ibrahimovic had a couple of impressive moments when engaging the ball-carrier with backwards pressing but for the large majority, Southampton built possession against a passive defensive block. The compactness of the home side was one of their more impressive qualities, with short distances being maintained between the chains of United’s defensive shape. The width of the block was fairly narrow as they prioritised the centre whilst, especially within their own half, there was little distance between Rooney and the defensive line. United’s compactness wasn’t ground-breaking, but sufficient in restricting Southampton’s possession. Although not at Marcelino or Schmidt levels of compactness, it was sufficient in enabling United to control the midfield against Southampton and likely many other Premier League teams in the future. By having a strong coverage of the space in the middle, United were thus able to control the game despite not having possession of the ball. They were able to minimise any threat which Southampton’s attacking game posed, and often restricted Puel’s side from attacking in their ideal manner. Southampton’s preferred attack locations were reflected by the narrowness of the attacking trio and United’s defensive line were similarly tight in reaction. Important to this level of compactness was United’s defensive orientation. The home side defended with a clear zonal-coverage, as the banks of four shifted from side to side and maintained well-connected. By maintaining a zonal coverage and not using the opposition as the primary reference point, United’s shape was less perturbed by any movement from Southampton. The spaces between the lines remained largely closed shut as Mourinho’s team could focus on keeping short distances between teammates over covering their opponents. The above-mentioned transition is certainly not going to be instantaneous, and we did see some man-oriented movements in the midfield throughout the game. Particularly done by both Fellaini and Pogba, they would follow their man loosely without straying too far out of position, meaning that stability and compactness wasn’t lost. The purpose of these movements was simply to maintain defensive access and further block any Southampton passes into their teammates in the centre of midfield. United’s compactness became greater around their own penalty area. As United retreated closer to their own penalty area, the distances between players shortened and they were able to crowd out the centre of the pitch. They made it extremely difficult for Southampton to break through the middle of their narrow attacking shape and instead forced them to play towards the flanks more. This strategy didn’t suit their positional structure very well and Southampton’s attack was less of a danger as a result. Playing in a narrow 4-1-2-1-2 formation, Southampton’s attacking structure was quite heavily focused on the centre of the pitch as they generally left the open wings to the marauding Targett and Cedric. After Romeu’s early injury, Pierre-Emile Højbjerg moved to the 6 position and dictated the ball circulation as Southampton took a rather patient approach to the game. Davis and Clasie acted as fairly orthodox 8s whilst Dusan Tadic played closer to the two strikers in a position higher than what you’d usually see from an attacking midfielder. Despite the front three being positioned closely together, Southampton were often unable to attack through them. Undoubtedly a portion of the credit has to be given to the compact defending from the home team, whose controlled defensive performance worked well to minimise Southampton’s threat. In the above-mentioned zonal scheme, United defended the centre effectively and against an attack which employed a similarly-focused structure, they stopped the away side from attacking in their preferred manner. However, the away side caused their own problems and one of the biggest issues could be seen in the spacing of the front three. Although they were close enough together to interact, the connections were not always strong enough for these interactions to be successful or effective. The links between the front three were often flat, and not conducive to progressive ball circulation and combinations. All three had a degree of freedom in their positioning, but the triangles created between the three were quite weak. It was rare that all three links were strong simultaneously and although they were connected, they weren’t connected well. With Southampton unable to establish threatening attacks down the middle, we increasingly saw them look to the wider areas as the match progressed. The ball-near forward would commonly make lateral movements where they could engage in wider possessions. Nathan Redmond in particular moved towards the right touchline where he could participate in the wider attacks and at times offer for longer passes through the channel. For all of their defensive efforts, United were unable to replicate a similar level of performance in their attacking play. According to Michael Caley’s expected goals model, they created just 0.7 xG throughout the 90 minutes (excluding the penalty) and often relied on the individual quality of their players to create in the final third. There didn’t seem to be a great emphasis on structured attacking from the home team. United’s forwards, and Rooney in particular, were given a degree of positional freedom as Mourinho gave a responsibility to his players when it came to creating suitable attacking structures. 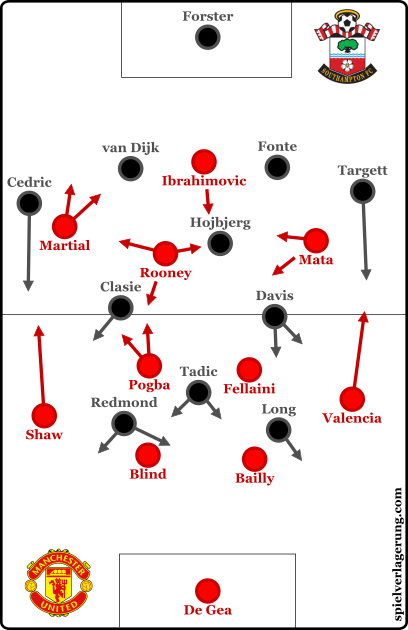 Although this made for an inconsistent and unclean structure for large periods, it allowed the individual stars of United’s attack to combine at times to create some promising situations. From his attacking midfield slot, Rooney could be seen engaging in possession in most areas of the pitch. The England captain was generally present in attacks down both flanks through his ball-oriented horizontal movement, whilst on a few occasions he could be seen dropping towards the centre-backs during build-up. Because of this positional freedom, he was able to have a presence in most attacks and use his tactical intelligence to complement United’s efforts whether it be through the left half-space or down the right touchline. Without a structure tailored to collective-driven attacks, United had to fall back on their enormous individual quality at times. Whilst the shape made it difficult to combine in groups, the quality of the players made this possible. With players such as Rooney, Ibrahimovic and Pogba, the Manchester side could make some threat despite not showing great cohesion in a system which is very much in a developmental stage. Individual actions were an important factor of United’s attacking. Pogba drove the ball forward as he does so well, whilst Ibrahimovic had multiple good moments, not least his excellent header to open the match. Against Southampton’s somewhat narrow defence, it seemed that Mourinho wanted his side to target the wider areas of the pitch in their attacking strategy. Pogba would commonly make movements towards the left touchline whilst Rooney’s free role saw him appear down either wing, such as when he made the cross for the Ibrahimovic opener from the right flank. With Mata moving inside, space was given for Valencia to isolate Targett. Whilst there was very much an overloading nature to United’s left-sided attacks, the dynamics down the right were much different. As he does so often, Mata had a role of coming inside through the right half-space, abandoning the flank to participate in more central attacks. In doing so, he provided the entirety of the flank for Antonio Valencia to use when going forward. This small movement scheme was done fairly often with the intention of creating isolation situations with Valencia pitted up against Matthew Targett. During such moments, the Ecuadorian wing-back could create a superiority of quality over his defender. Generally trying to emphasise his pace and dribbling, Valencia was able to get past the young full-back on a couple of occasions yet hindered by a poor delivery into the box. However, he was able to provide the pre-assist for the opener by playing a ball down the touchline to an on-rushing Rooney. As the game progressed and eventually became 2-0, United were increasingly defensive-minded in their approach. The wingers were more ready to drop closer to their full-back when in a low-block whilst the attacking strategy became slightly more conservative. More players were left in deeper positions in order to limit Southampton’s transitions although the likes of Pogba still made his aggressive forward runs. Whilst all eyes were on Pogba, it was Ibrahimovic who stole the show in an otherwise uneventful match. From early in the game, United controlled the game through their defensive performance and, although they didn’t create many chances in attack, they could rely on individual quality to bring about a 2-0 win. From the perspective of Southampton, there were some positives to take despite the loss. After moving to the pivot position, Höjbjerg looked more-than competent in the role at the deepest point of the Saints’ diamond. He displayed an intelligent positional game whilst he was adept in supporting their deeper ball circulation. Although they failed to establish central attacks through their front three, they will come up against many defensively-weaker sides in the season to come. Can’t wait to see Pep’s City against this United. Going to be a tough match, I would have thought.